Your first priority when buying a new car is to find something that will get you to your destination without any hiccups, but that doesn’t mean you don’t have a checklist of other must-haves to make it the perfect car for you. 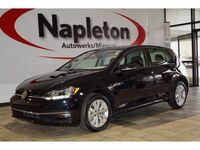 If your list includes fuel efficiency, a spacious interior with plenty of cargo space plus a driving style that is smooth and comfortable, you’ve found the perfect match in the 2015 Volkswagen Golf in Springfield MO. The fuel efficiency for the 2015 VW Golf is an EPA estimated 25 city/37 highway mpg rating, which means you can get up to 488 miles per tank. Commuters will love the Clean Diesel TDI trim style for it’s even more impressive 31 city/45 highway mpg rating reducing time spent at the pump. With a starting MSRP of $17,995 this car is an affordable choice for those seeking to get the keys of a new vehicle. The 2015 Volkswagen Golf is quickly becoming a favorite with VW fans for its exceptionally smooth ride and long-term reliability. A 1.8L turbocharged 4-cylinder engine comes standard in the base model, giving it 170 horsepower for smooth acceleration. TDI drivers admire the 2.0L, 150 horsepower engine which gives it low-end power for optimum fuel efficiency without a sluggish feel. The driving experience is surprisingly quiet, even at high speeds, making this vehicle the perfect choice for long trips. Precision steering, nimble handling and strong brakes combine to create an easy driving experience. The 5-speed manual transmission comes standard, but a 6-speed automatic is available. The spacious cabin is made with high-end materials that give it an upscale feel and five adults can expect to sit comfortably. The front features durable bucket seats that come standard with cloth upholstery, though leatherette is available. The rear cabin area is surprisingly spacious, extending the 22.8 cubic feet of cargo space to an impressive 52.7 when the seats are folded flat. Many family cars are only filled with the entire crew after school or on weekend outings, which leaves parents driving solo much of the time. So why shouldn’t your family car be a little fun? With the 2015 Volkswagen Golf in Springfield MO you get a the simple joy of a fun drive, plus a premium interior for a quality feel every time you put the keys in the ignition. Standard features that enhance the experience include Bluetooth connectivity, a 5.8-inch touchscreen display, heated side mirrors, power windows, and an eight-speaker sound system. Available features include a sunroof, rearview camera, rear parking sensors and a navigation system. When the family is together, you want safety to be at the highest standard possible. That’s why the 2015 VW Golf includes Electronic Stability Control and Engine Braking Assist to help keep the vehicle in line when driving on slippery road conditions. A crash-optimized front end and pedal controls pair with side curtain protection airbags to provide safety in case of an accident. Volkswagen’s Intelligent Crash Response System gives added peace of mind, since it will automatically shut off the engine, unlock doors and turn on cabin lights when the airbag is deployed. This means easy departure for occupants and easy access for first responders. Safety, comfort, fuel-efficiency and a quality build all come together in the 2015 Volkswagen Golf. Schedule a test drive at Volkswagen Springfield to see for yourself why it has earned such high praise.